This married couple are far from conventional having never lived under the same roof since they met 16 years ago. Claire and David Burke, from Bradford, West Yorkshire, enjoy an evening in front of the TV together with a glass of wine before Claire waves her husband goodbye as he makes the ten-minute drive back to his own house just four miles away. The couple say their unusual living arrangements make their relationship stronger than ever - and can count on one hand the number of times they've spent the whole night together. Claire, 49, said: "It just doesn't work for us to live in each other's pockets. On our wedding night, we spent the whole night together and it was awful. "It was one of the hottest days of the year and we were exhausted after the long day, we just fell asleep with lots of fans on. "We're both used to having the bed to ourselves. "We have talked about moving in together, but it's just never happened because we are so content with the way things are and if it's not broke why fix it. "We still both have our independence and it makes our relationship more solid. "It means that I miss him and look forward to seeing him more, I still get those butterflies when he walks through the door." 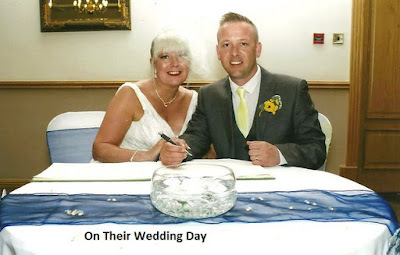 Claire worked in admin for the West Yorkshire Fire Service when she met her future husband, David, 43, who was training to become a firefighter. Claire said: "We built up a friendship first and then one thing led to another but we never really had the idea of moving in together. "David works shifts so we spend a lot of time in the day together and we might occasionally sit and watch and film but cosy nights are few and far between. "We get the best time of the day together because it's just us, while Jay is at school, and we can go for lunch or coffee." The couple have never shared a bank account, keeping finances strictly separate, and claim it causes fewer arguments in their relationship. Claire said: "Money is kept separate and that way I don't need to tell him off for buying things and it's the same for me. "If we want to but things we have the freedom to do so. "I never wanted to become a nagging wife and this way we don't argue." 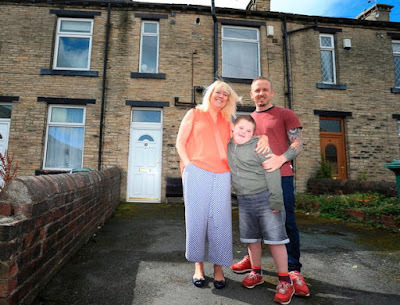 Claire and David have still remained in separate homes despite having their son, Jay, seven years ago, who was born with Down's Syndrome and enjoys spending time with both parents in both houses. "I'm now a full-time Mummy and we realised he has grown up like any other child." David said: "I normally leave about 7 pm on a week day and sometimes later on a weekend, when Jay has gone to bed, Claire loves watching soaps so I leave before Emmerdale. "We do both snore pretty bad but we just think, no matter how big the bed is, it's still such a close space." Despite living separately the couple has no regrets and think it could be the key to a successful marriage. Claire said: "There is nothing I miss or regret about living separately. "Lots of people like cuddling but at 2 am but to us, it's annoying. "It's not a traditional relationship but we are soulmates." David said: "Men and women are very different, there is no denying that, so by not living together we don't have to compromises or change who we are." "I'm still in love with the person I met 16 years ago because she hasn't had to change." » Though Khloe Claims She Has Never Heard Of Designer Who Accused Her Of Copying, But Fashionista Says You Lie, I Have Got Receipts! » Omg...Indian woman re-raped by SAME MEN who gang raped her 5 years ago!